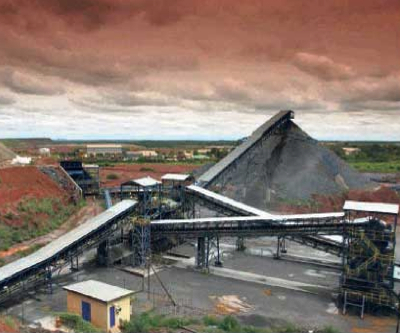 Gold miner Randgold Resources (NASDAQ:GOLD, LON:RRS)) cut its production guidance for its Tongon mine in Ivory Coast after a fire in the mill section of a plant. The company now expects full-year production of about 208,000 ounces, compared with analysts’ expectations of 230,000 ounces. The fire started on Christmas Eve during a planned maintenance shutdown and it has now been extinguished, with no casualties or injuries, said the miner in a statement. CEO Mark Bristow said the full extent of the damage was still being assessed but the mills themselves had been unaffected. The mine has already started to make short-term repairs including temporary relining of the various pieces of equipment whilst sourcing replacement parts. Management aims to have both milling circuits operational again within ten days. Tongon is Randgold’s newest gold mine, starting production in 2010. Randgold owns the majority of Tongon and it operates the Loulo, Gounkoto and Morila mines in Mali.